Various - "Heimatklänge Vol. 4: Carnevale Caribe"
500 years ago Columbus travelled far - Heimatklänge (Berlin´s Summer Festival) goes farther! This musical vessel-of-all-seas sails along the white sandy coasts of the Caribbean sea, where king-palmtrees reign, but life is not only sweet. Here to be discovered are the deep roots and sweet fruits of the Caribbean music jungle. Welcome on board: the heartbeating sounds of Toto's palenque drums, the swinging Cumbia of Alfredo Guierrez, the breathtaking speed of Francisco Ulloa´s accordeon, the rock-steady blowing of Rico´s trombone, big-band American-ballroom grandeur à la Mario Bauzá, the spicy salsa cubana of Orchesta Cumbre, the bewitching voodoo trance of Rara Machine, the untamed soul-calypso of Machel Montano and the seducing, bone-shaking Merengue of Victor Roque. Put down your cocktails! Get up and dance, dance, dance!!! 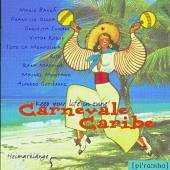 GET IT HERE: "Carnevale Caribe"